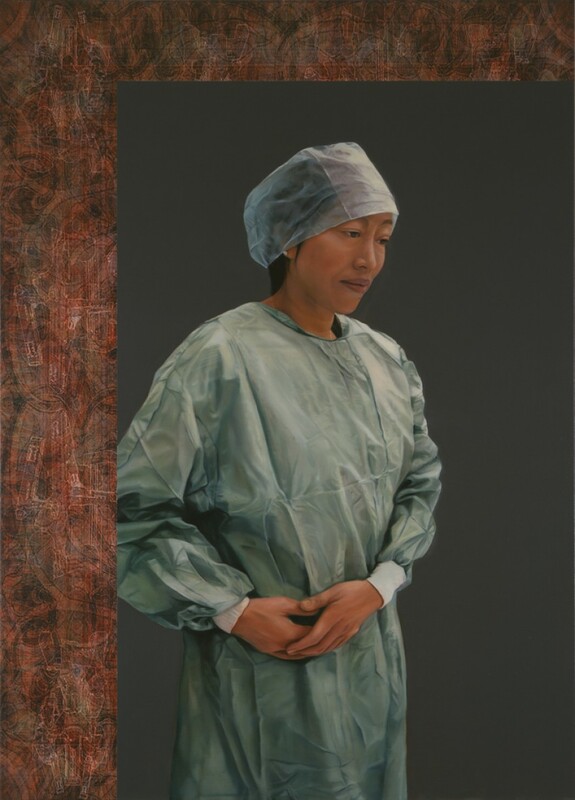 Dr Susan Lim was made a Fellow of Trinity College in 2005, the youngest Fellow at that time. Fellowship of the College is the highest honor the College can bestow. On the occasion of the installation dinner, General Pete Dawkins flew in from US as guest speaker and Dr Susan Lim spoke on “New Frontiers in Medicine”. To commemorate the installation, Trinity College commissioned Australia’s leading artist John Young to paint her portrait which hangs in the dining hall of Trinity College, alongside the portraits of other distinguished Fellows. 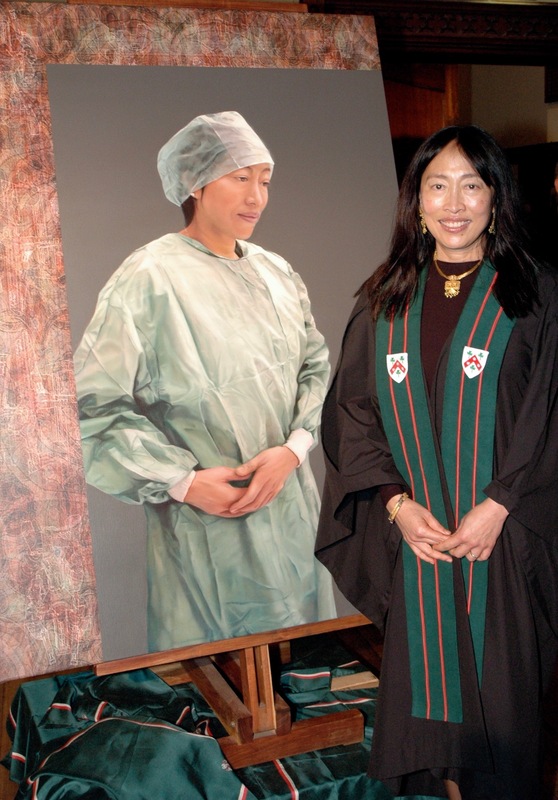 A TRINITYUpdate from 2004: Susan Lim, a Medical Pioneer Honoured. Administration: The governing body of the College and/or the Foundation Executive Committee. More info on the Dr Susan Lim Medical Scholarship on the Trinity College website. Susan Lim entered the College in 1974 under the wardenship of Dr Evan Burge, although she was studying at Monash University. She was an outstanding medical student who was also a keen rower at College. She completed her MBBS in 1979, and and her Doctorate in 1984. She has become one of the leading surgeons of the region, and the world, and participates in conferences around the world, with a special interest in stem cell research. She was elected as a Fellow of Trinity College in 2005 for her outstanding contribution to medicine and humanity around the world. On behalf of the Warden of the College, Professor Donald Markwell,I am delighted to welcome you all to this Choral Evensong to celebrate Trinity Sunday, at which we have—as one of the highlights of the College’s year—the installation of Dr Susan Lim as a Fellow of the College. As we dine in this Hall of Fame, I cannot but feel humbled by Trinity's many distinguished alumni - including 35 Rhodes Scholars – who have made their mark in business, the professions, academia, governments, and communities around the world. This achievement has established Trinity as one of Australia's premier tertiary institutions for nurturing academic excellence, leadership, and community service. As we dine here tonight, I would like to immerse you in some historical college milestones: The College established its residential undergraduate program in the late 19th Century. 1886: Trinity became the first University college in Australia to admit women students as residents. 1974: Dr Evan Burge installed as Trinity’s 5th Warden of the College, and it was through him, that I gained entry into Trinity from Monash. 1997: Professor Don Markwell, a former Rhodes scholar installed as 6thWarden of Trinity College. In 1989, the Trinity College Foundation Studies Program was started to prepare able international students for undergraduate study at the University of Melbourne. Since then, Trinity has flourished and grown, with over 13,000 alumni living around the world today. Far more students apply for places at Trinity than can be offered places. Entry to the College is unavoidably competitive and selective. Of the 50 countries in which there are Trinity alumni, the largest numbers are in Australia, Malaysia, HongKong, Indonesia and Singapore. The friendship between Australia and Singapore dates back to the time when Singapore achieved its independence in 1965. Over the years, the friendship and goodwill between our two countries has blossomed, such that today, Singapore is Australia’s largest trade and investment partner in SE Asia. Among the many facets of this friendship, was borne the Colombo Plan Scholarship, an educational cooperation between the two countries, and I was fortunate to be a recipient of this. I came to Trinity College in 1977 for my clinical years in Medicine. I was immediately impressed by the caliber of the Faculty, the open and learning environment, and became immersed in college culture, including parties and my passion for women’s rowing, which taught me the importance of team work and team dynamics. At Trinity College, I spent my formative years in clinical undergraduate study. I felt intellectually inspired by the high academic standards and individual mentoring, and the cultural and spiritual life at college helped develop my personal breadth, balance, integrity, leadership, and international awareness. Which brings me to my profession. The field of medicine today, is undergoing dramatic changes. Hospitals are working toward digital universal medical records with instant access to all images and data. Safety, security, and standards issues with regard to online access, on-line digital diagnosis and treatment will need to be addressed, and self-help groups will drive future medicine. There will be an explosive growth in tele-medicine with remote reporting of xray images already being outsourced to Indian hospitals, and teleproctoring, training and specialist consultations long distance are already currently available. Remote telesurgery or long distance surgery has already been accomplished in the landmark telesurgery operation conducted in New York on a patient in France. As we speak, health screening programs in force in many countries facilitate earlier diagnosis of dreaded diseases such as cancer. And many new and exciting technologies for the treatment of early tumours, such as the cyberknife, cancer probes, and magic bullets, and viruses that will for a change, actually make us better, are just around the corner. As a result, hospital stay for the sick will be shorter, and most treatment will be in an outpatient setting. The new medicine encompassing stem cell and gene therapy will soon allow us to redesign the human race, produce designer babies, and clone ourselves for spare parts. The new bionic race will have digital bodies and digital brains. And while the digital revolution changes what we do, the genetic revolution will change who we are. There will be smart “lifestyle drugs” for designer people and robots or digital doctors will be recruited to treat the sick and decide future therapy. There will need to be a total rethink about the training of physicians. The gap between doctor and nurse, and surgeon and biomed technician will narrow. Surgeons will become skilled health technicians and the roles of nurses and paramedics will be extended. With the ageing of the human population, there will be an acute demand for home nursing and monitoring. Can we stop ageing? Regenerative medicine and stem cell therapy will provide replacement tissues for soft tissue, muscle, heart, nerve, cartilage, bone, liver and pancreas. The aged face will be plumped up overnight with stem cells that will recreate the fullness and volume lost with the years. Hair and teeth may be replaced, cardiac cells will repair damaged hearts and patients with osteoarthritis will have access to new cartilage to resurface diseased joints. The differentiation of stem cells into nerves will enable a repair of the spinal cord, fulfilling the late superman,s dream, there will be vaccines against rheumatoid arthritis, cancer and perhaps a vaccine to prevent baldness, a cure for HIV and SARS, and gene therapy even for the common cold. All this is exciting but when can this be made available to the public? Unfortunatey, biotechnology is usually undersold, unlike digital technology which is always oversold. There are always ethical concerns, funding is hard to come by, and then there are patent issues. Biotechnology innovators have to struggle to prove, as opposed to digital innovators whose early adopters enjoy overnight fame and success. I want to share with you two areas which I am currently focused on and which I believe will have significant impact in their respective areas of application; namely robotic surgery and stem cell research. This is an abbreviated tour of my Clinic and Lab activities, and I hope you will enjoy. So it is evident, with this Health care revolution, that there will be an unlimited power to change our future life. There will be a huge rise intandem of techno-medicine costs as new and better technology giving rise to resource conflicts. Finally, there are the Social responsibilities of this health revolution. Healthcare costs have soared, due to more widespread use of expensive technology and the demands of ageing populations globally. What can we do? The answer lies in the education of our global citizens. The gap between the rich and the poor, whether nations, societies or individuals has to be narrowed. There is no better tool to narrow this gap then through access to education irrespective of whether one is born to an impoverished family in an underdeveloped country, or to the more privel;eged classes of the developed nations. Technology has its own natural momentum, created by scientific curiosity. But the driving force for philanthropy must constantly be renewed. It begins with the altruism of families, organizations and individuals, unselfishly dedicated to the welfare of human beings. 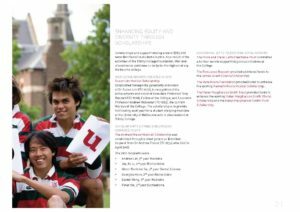 At Trinity, there is a tradition of philanthropy which enables the College to offer scholarships to help talented students obtain the very best education at Melbourne University. My husband Deepak and myself have, in our own small way, founded a charity at the turn of this Century. We have called this the Indiapore Trust. which helps underprivileged children access the technology platform. Finally, I would like to specifically address the students in this audience. Trinity College provides one of the best educational springboards, value systems and opportunities which can transform your lives. Set personal goals, work conscientiously to meet them, grow in knowledge and sophistication, and become a true citizen of the world. I wish each of you every success in seizing the many exciting opportunities that lie ahead. Visit Dr Susan Lim's YouTube channel for a video of the full speech.